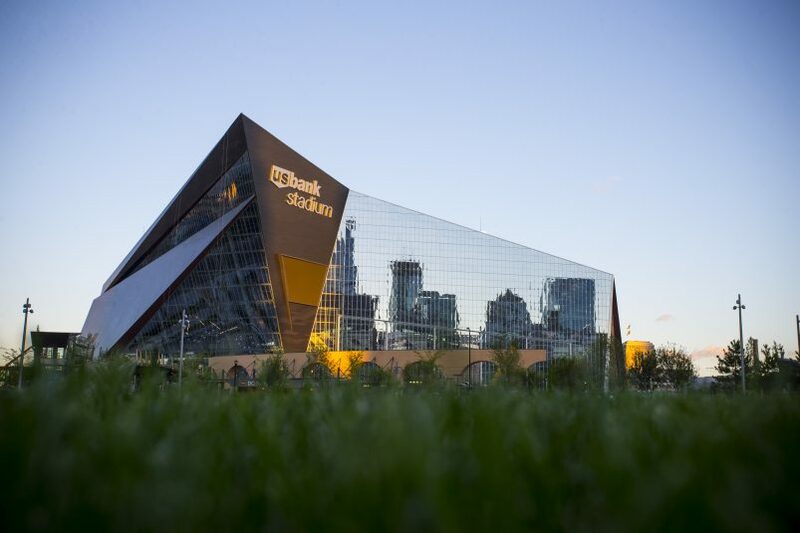 U.S. Bank Stadium, one of the most highly anticipated new venue builds, is just days away from hosting its first NFL game and welcoming thousands of passionate Minnesota Vikings fans. After two seasons in nearby TCF Bank Stadium (on the campus of the University of Minnesota) and more than three decades in the now-demolished Hubert H. Humphrey Metrodome, the Vikings’ video-production team is ready. The Vikings will play their first game in their new home on Sunday. The Vikings play their first game in their new home on Sunday, a preseason matchup against the San Diego Chargers. Though not the first sports event to be played in U.S. Bank Stadium — a soccer match was played earlier this month — the game officially begins the next chapter in Minnesota Vikings football and will shape the future of NFL fan engagement. In fact, before U.S. Bank Stadium even opened, the venue was selected to host Super Bowl LII. U.S. Bank Stadium is owned and operated by Minnesota Sports Facilities Authority, which contracted Van Wagner Sports and Entertainment to oversee the design of the venue. HKS served as the stadium’s architect, and SMG manages the facility. In December 2013, the Vikings played their last game at the Metrodome and began construction on a state-of-the-art, 65,000-seat stadium that would occupy the same footprint. The team played the 2014 and 2015 seasons across the Mississippi River at TCF Bank Stadium, a significantly newer venue than the 32-year-old Metrodome. A large videoboard in the west end zone of TCF Bank Stadium (which opened in 2009) gave the Vikings Entertainment Network staff a chance to hone their skills before tackling the video displays at their new home. Within the new stadium, Minnesota Sports Facilities Authority and the Vikings looked to install the largest videoboards possible. Together, they tapped Daktronics to design and build a 13HD LED videoboard that sits low in the west end zone and measures 8,100 sq. ft. The main display is 68 ft. high x 120 ft. wide and features two 43- x 15-ft. wing displays that can either supplement the main display or be joined to the main display to show one large image. A 9- x 64-ft. “skirt” display at field level provides additional graphic and sponsorship opportunities. U.S. Bank Stadium features the most square footage of 13HD LED display in the NFL. A second, slightly smaller video display sits low in the east end zone, stretching 50 ft. high by 88 ft. wide with a 25- x 15-ft. wing displays on each side. Three ribbon boards circle the bowl: a 3.5- x 1,550-ft. display on the upper concourse, a 2.5- x 1,475-ft. one on the club level, and a 5- x 225-ft. one on the press level. In total, Daktronics added 18 LED displays around the stadium. According to the Vikings, the total square footage of 13HD LED displays will be the most in the league. Vikings Entertainment Network, the video-production arm of the Minnesota Vikings, will take advantage of the 16:9 aspect ratio of the two primary video displays and create content that can be used across a variety of platforms. In addition to overseeing game-day video production, the group is responsible for all Vikings entertainment initiatives, including TV, radio, digital programming on Vikings.com, and social-media platforms. The production personnel responsible for each platform under the group’s umbrella take part in a daily call to share their current projects and gauge opportunities for content sharing. Vikings Entertainment Network will also provide content for the team’s in-stadium mobile app. Powered by VenueNext, the app will incorporate fan-friendly amenities like digital ticketing, concession ordering, and directional information, as well as the NFL RedZone Channel, three out-of-town games, the broadcast-network feed, and six replay angles. With thousands of square feet of LED signage, not to mention a slew of digital platforms and social-media outlets to support, Vikings Entertainment Network required a video-control room that was technologically advanced enough to handle the venue’s video needs and large enough to fit everyone. 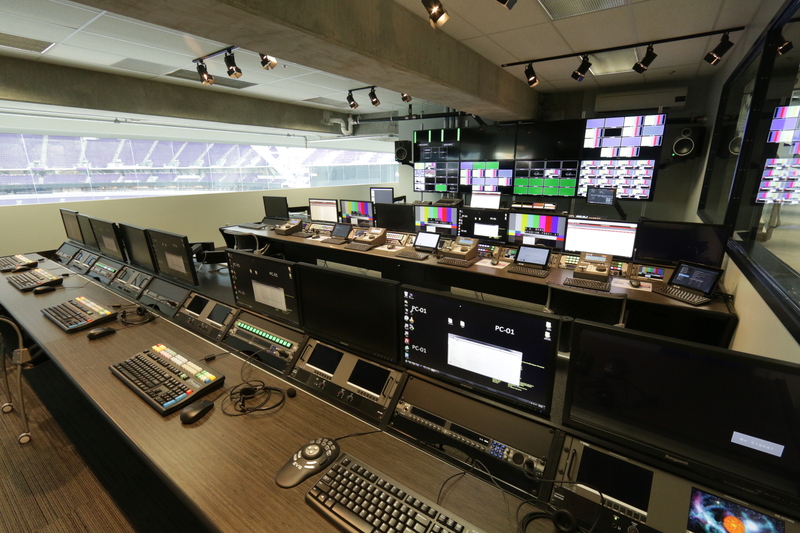 Located on the press level in the southeast end of the stadium, the video-control room seats approximately 50 people, including game-day production staff; operators for LED, VenueNext replay channels, IPTV, and Sportvision 1st & Ten; and the Vikings Entertainment Network content teams in charge of the website and social media. Inside the Vikings’ video-control room. In addition to production personnel seated at the three benches, approximately 30 game-day staffers will be seated at the window overlooking the field. Van Wagner Sports and Entertainment contracted Eden Prairie, MN-based Alpha Video Sports & Entertainment to integrate the video-control room and work with Daktronics on the LED elements around the stadium, CenturyLink and Cisco on the venue’s StadiumVision deployment, VenueNext on the aggregation and encoding of all replay content on the team app, and Parsons on the coordinating connections to the sound system. Alpha Video worked with the Vikings, Minnesota Sports Facilities Authority, and SMG, as well as with Harper and U.S. Bank Stadium Director of Production Tadd Wilson, to build out a robust equipment package within the group’s budget. The finished project is a hybrid of IP and baseband technologies that support 4K content capture and 1080p output to the video displays. The control room features both Evertz IPX and baseband routing, an 8M/E Ross Acuity switcher with 4M/E and 2M/E control panels to cut secondary shows, and Ross XPression graphics systems. 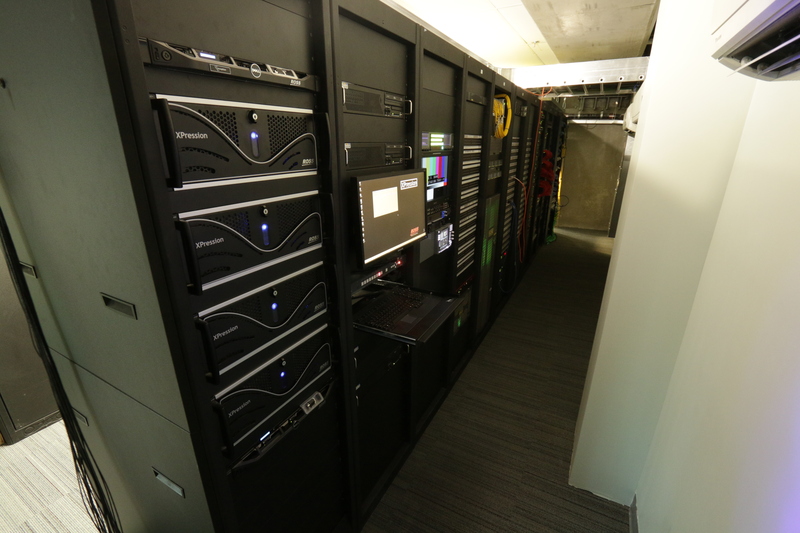 The all-EVS room houses a wide range of EVS products, including three 12-channel 1080p replay servers, one 4K replay server, IPDirector, Epsio Effects, and MultiReview. 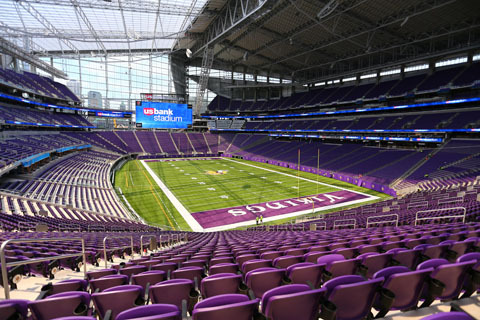 A dedicated 4-Gb pipe connects U.S. Bank Stadium with the Vikings’ training facility in Winter Park, MN, where a Scale Logic shared-storage system provides asset management. Notably, the Vikings paid particular attention to the in-game cameras, selecting a total of eight Sony HDC-4300 cameras that will operate in 4K. “Those will hit an IP routing layer natively in 4K, where they can be routed to StadiumVision or to other places,” explains Alpha Video VP Jeff Volk. “In terms of the videoboard production, they’re downconverted to 1080p; however, the IP routing also allows them to route some of the 4K cameras to an EVS 4K replay system that will allow them to do 1080p region-of-interest extraction.” Two wireless cameras, one with a Steadicam rig, round out the in-game cameras that Vikings Entertainment Network will have at its disposal. Five Sony PMW-F55’s were added as POV cameras: three situated along the sidelines, one in the corner rafters, and one directly above the 50-yard line. The Vikings and Alpha Video added a separate, enclosed rack room. Harper will have the opportunity to take network feeds from the broadcast truck — and share his team’s unique views, like the 50-yard-line shot, with broadcasters — but he plans to pick and choose only those feeds that will add something special to his team’s show. When the Vikings take the field in their first game on Aug. 28 and then face off against rival Green Bay in their regular-season opener on Sept. 18, Harper’s team has plenty in store to rev up Minnesota faithful. Vikings Entertainment Network plans to use all the tools in its arsenal to create dynamic, full-screen video and take advantage of stadium elements like LED lighting to really put on a show.